Galette is a general term used in the French cuisine to designate various types of flat, round or freeform crusty cakes [thanks Wiki], and can be done with almost anything you can think of. Usually it is garnished with egg, meat, fish, cheese, vegetables but don’t limit yourself to these ingredients… let your imagination run wild. [heh] However, for mine I chose zucchini and ricotta cheese, and it was a very fortunate selection. Ok, so I did buy the puff pastry from the store, but making it home can be a bit time consuming and I wanted something fast. Still, it is delicious just the same. Anyway, start mixing ricotta cheese with some shredded mozzarella. Mix it well then place it in the fridge for few minutes. Take one zucchini, slice it in thin pieces and spread them on a paper towel with a bit of salt sprinkled over. Let it sit for about 30 min for the water to come out of it. While zucchini is doing it’s thing, chop up some fresh dill and add it to the cheese mixture. After 30 minutes and after all the water got soaked out of the zucchini, roll out your puff pastry in a big circle, about 12-14 inches (30-35 cm) in diameter. Place the pastry over a cookie sheet, again I use silpat over mine, and add the cheese mixture in the center of it. 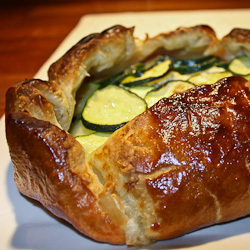 Nicely place the zucchini over the cheese, then fold up the edges of the pastries over the zucchini so that it looks as in the picture below. Brush the galette with egg. Cut zucchini in thin slices and place over paper towels, sprinkle some salt over it and let sit for 30 min so the paper soaks up all the water. Mix the ricotta cheese, mozzarella cheese and fresh dill in a small bowl. Roll out the puff pastry in a 12-14 inch (30-35 cm) round pastry and place it over a cookie sheet. Place the cheese mixture in the middle, and arrange the zucchini nicely on top. Roll up the ends of the puff pastry and brush with egg. Bake for about 30 to 45 minutes or until golden brown.